Close up of the 4-inch fabric blocks in Blue Yellow Ninepatch lap quilt and wall hanging. Sometimes it’s hard to find a gift for someone in a hospital and nursing home. You don’t want to give something that may be damaged or misplaced and this little gem is a wonderful option. Blue Yellow Ninepatch Lap Quilt Wall Hanging is a brand new imported lightweight lap quilt in bright yellow and blue multi-patterned cottons. The backing is also a bright and cheerful fabric with printed yellow and blue flowers. The lap quilt also comes with a built-in sleeve so this tiny reminder of sunshine can be hung on a wall. Close up of the backing and sleeve on Blue Yellow Ninepatch Lap Quilt and Wall Hanging. One of our customers recently purchased a Blue Yellow Lap Quilt Wall Hanging and had friends write good wishes in the blocks with an indelible pen. Another option is to have custom embroidery added with a special dedication in the bottom blue border. 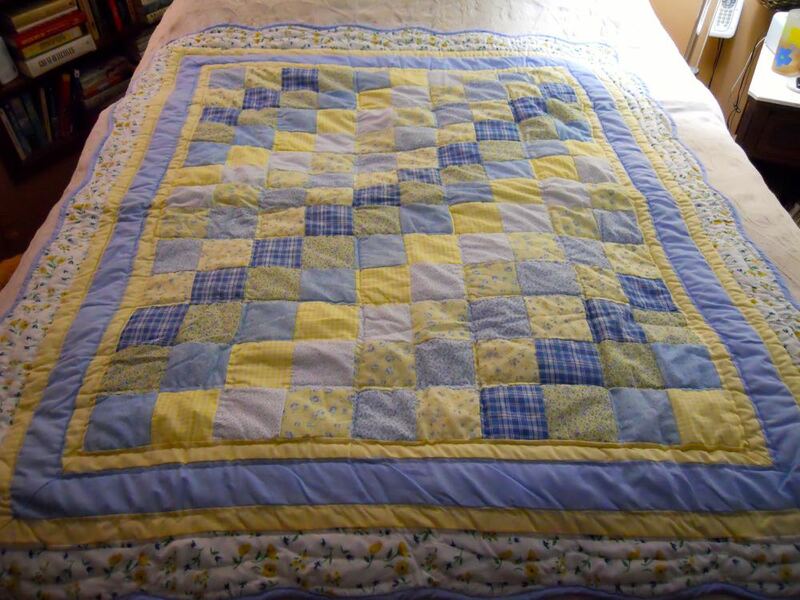 Blue Yellow Ninepatch Lap Quilt Wall Hanging on a bed to show all of the included fabric colors. I have a personal connection to these colors and design. Years ago, I gave something similar to my grandmother as a housewarming gift when she moved into a nursing home. Only instead of calling it a ninepatch pattern, we decided this was an irish chain. My most recent customer insisted this was more of a ninepatch so we’re leaving it named as she requested. 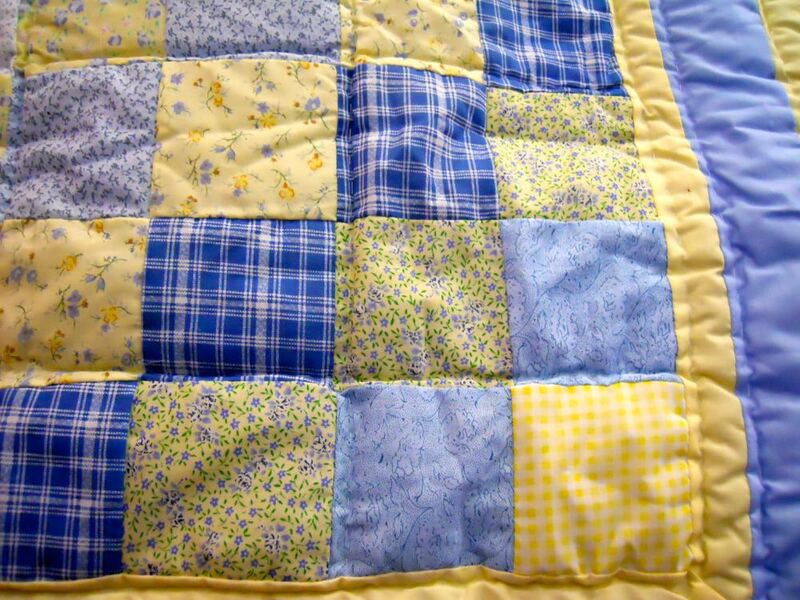 Whatever you call it, Blue Yellow Ninepatch Lap Quilt Wall Hanging will brighten anyone’s day!